“I have a ridiculous question,” read a text from my friend. “Shoot. What’s up?” I texted back three days later, even if I swear I already sent a reply mentally. Okay. That’s a legit question, not ridiculous at all. As the first among my circle to have a kid, I always get bombarded by a million random questions about pregnancy and motherhood from friends who are: a) afraid that they are pregnant, b) want to get pregnant, or c) are expecting their little human. You could say that I have become my squad’s baby expert, albeit unofficial. And because my friend will be meeting the stork in two weeks, she has been asking me more questions lately, wanting to get everything ready for her little one’s arrival. So this one’s for you, K...in case I forgot to text you back. Let’s start with the essentials. Now before you can dress up your baby, you have to make sure that you have a set of comfortable baby clothing ready. Obviously. With such a huge newborn clothing selection—from designer clothes to time-savers outfits—it can be tough to make the right choice. So here’s a tip: when buying clothes for your newborn, common sense trumps fashion sense. Babies don’t need a huge variety of cute and colorful outfits for the first few weeks of life because they grow up really fast. Not only that, you’ll probably be too busy taking care of your little human to worry about adorable matching outfits. So for now, your top priority should be keeping baby safe and comfortable. In my case, I followed my mom’s advice and made shopping less hassle-free by buying all-white newborn clothes. They’re easier to wash and are more comfortable. But what exactly do you need to buy? Here’s a suggested list of clothing and number of items that you may need from birth. Before anything else, stay calm. I know you’re scared—I was, too. In fact, it took me a week or two before I grew confidence to dress and undress my baby myself. I had to keep asking my mom to help me because I was deathly afraid of doing it wrong and hurting my baby. Fortunately, I was able to shake the fear off. And I know you can, too. Place your baby on his changing mat on a flat surface. If you’re dressing your baby up on a changing table or the bed, make sure to never leave him unattended in case he falls off. To put on a vest or shirt, gently stretch the neck opening and gather the fabric so it fits over your baby’s head comfortably. Lift your baby’s head and carefully place the shirt over the head, slowly pulling the shirt over his body. Then, gather the sleeves up to the cuff and put your hand into the sleeve from the outside to grasp your baby's hand. Don’t try to push your baby’s arm through the sleeve or armhole. Also, be careful to keep their fingers clasped together so they don’t accidentally get bent back. You can then lift baby’s bottom up and slide the vest down. If you’re putting on a bodysuit or a sleepsuit, unbutton or unzip it and lay him on top. Start at your baby’s feet and legs first and slowly work the outfit up the body. Ease the sleeves down over baby’s arms. Again, make sure that the fingers are clasped together. You can then pop on scratch mittens over your baby’s hands. These can help keep babies warm and prevent them from scratching their faces. To take a vest or shirt off, start at your baby's head. Carefully pop the fasteners open and pull the outfit over the body. Open and stretch the arm sleeve to get your baby’s arm gently. Do the same with the other arm. Stretch the neck opening again and be sure to lift your baby's head gently, supporting the body with one hand. Be careful not to twist any of your baby's limbs at any time. To get a bodysuit off of your little one, unsnap the fasteners. Pull down the vest over the body and legs. Slowly remove the sleeves, working down toward the wrist. 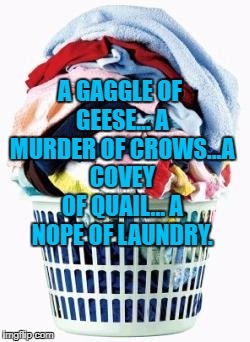 Aaand that, my dear, is when the laundry eventually starts to pile up.